Our very first guest blogger post, brought to you by the amazing Caitlin Howle! I always thought that the day my life would officially be over would be the day I bought a car seat. But being a (step)mom proved me wrong. Let me start off by saying that I love my car. It’s a pretty old Honda Accord two-door. Black. Spoiler. Red stripes. A sports car for the grad student budget – which I was when I bought it. My car is not a family car. In fact, when I started the process of settling down with my fiance and his daughter, my own dad told me that I would have to give up my “cool” car. 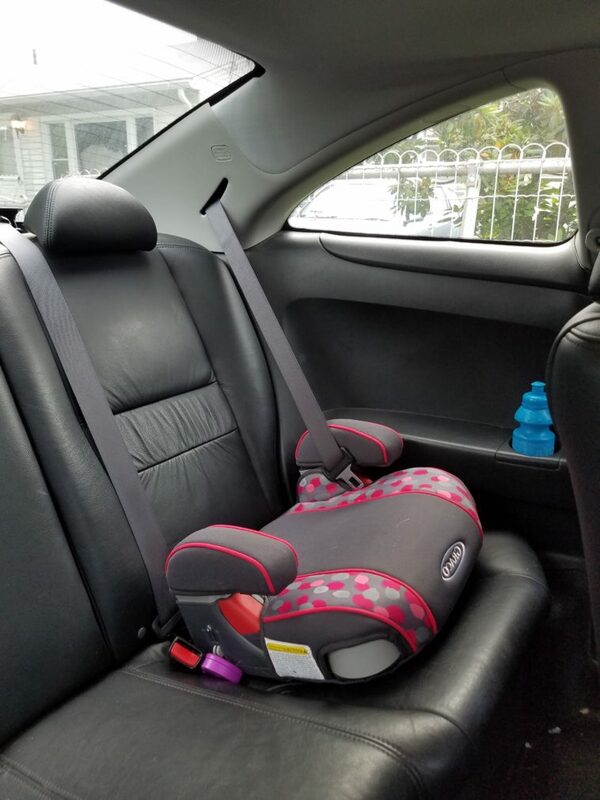 A few weeks ago I was cleaning out my car, and my (step)daughter asked if she could sit in the back seat. She crawled through the front of the car, thoroughly amused by the two-door and the leather seats. As she sat in the back seat, she looked through the front windows and said, “I really like your car.”I continued cleaning and said back, “Maybe you’re big enough for a booster seat, and we can put one in the back. What do you think?” “YEAH!” was her reply. We let her pick out which booster seat she wanted, and while I prefered one in gray, she went for one with hot pink circles (we can’t win ‘em all!). We bought the booster seat, took it home, and then she and I put it in my car together, and her dad made sure that the seat belt fit her just right. To say she was excited was an understatement. She kept exclaiming how she wanted to ride in my car, and kept asking if it was time to ride to her grandmother’s yet. When it was finally time, she bounced out of the front door and down the driveway to where I was parked. When we got in the car and got her buckled, she couldn’t stop giggling. It seemed to be the only expression that captured her happiness. I rolled down my windows and as an extra treat, opened up my sunroof. “I LIKE THE ROOF WINDOW!” she exclaimed, loudly, and giggled again. I put the car into drive and we drove off to her grandmother’s house. We spent a few hours there and then packed back up into my car for the ride home. Being a (step)mom isn’t easy, especially when it comes to creating connections with your (step)children. But, for the first time, having a car seat didn’t seem like a bad thing to me. It wasn’t the end of being cool, or a symbol of being too much of an adult. Instead, it became one more way that I could bond with my (step)daughter. And that is as cool as it gets. Pair with: Your favorite everyday glass of red wine. 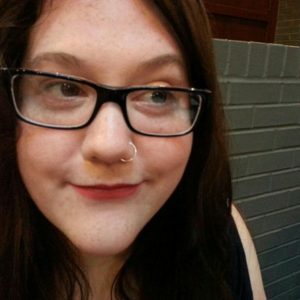 Caitlin is a writer, reader, and general lover of life living in Providence, Rhode Island. She works in social media and is finishing her master’s degree in English at Rhode Island College. Her fiancé and she will be getting married in the Fall of 2018, but she has already fully embraced the (step)mom lifestyle.